In the fall of 2013, Sacred Heart Parish began a Stewardship Program called, Offertory Enhancement offered by the Catholic Foundation of Central Florida Corporation, Inc. The parishioners of Sacred Heart parish were invited to prayerfully consider what they would like to give back to God in thanksgiving for all His blessings. This included the parishioner’s time, talent, and treasure, or financial resources. As part of our Offertory Enhancement Program, we recommended that each household give 10% of their annual income back to God, 5% to the church, and 5% to a favorite charity. We recommended strongly that each parishioner prayerfully consider giving to one favorite charity rather than many. When Fr. John Murray, C.Ss.R., Past Pastor of Sacred Heart Catholic Church in New Smyrna Beach, talked to his parishioners about stewardship of time, talent and treasure, he prefers to speak in terms of prayer, sacrifice and mercy. “Being good stewards of our time means developing our prayer life. Making the best use of our God-given talents means sacrificing for Him and the church,” said Fr. Murray. The stewardship that blossoms from prayer will come full circle with the dedication of the new Father Browne Prayer Garden at Sacred Heart on March 29. Establishing the garden had been a focus of discussion for quite some time, but Fr. Murray said it took a parish wide re commitment to stewardship to get the project moving forward. 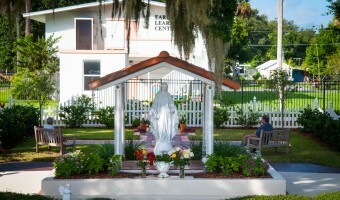 He credits the 12-week program, conducted by the Catholic Foundation of Central Florida and sponsored by the Diocese of Orlando, with helping to “awaken stewardship at the parish.” To date the parish has seen a 19% increase in total offertory collection, as well as a rise in volunteerism, since the launch of the initiative. Father Murray recommended the garden, and the project took on new life. Other parishioners stepped forward, making their own financial contributions and logging countless volunteer hours. At the entrance way to the garden, a statue of the Blessed Mother beckons the faithful to pause in prayer. Once inside, visitors will find themselves surrounded by viburnum shrubs that should eventually grow into a fragrant six-foot hedge. The groundwork features a magnificent San Damiano cross fashioned from more than 1,000 memorial pavers and framed by cobblestones and a newly planted flower bed. Two memorial benches are tucked away in grassy corners formed by the arms of the cross. The San Damiano cross, known for its association with St. Francis of Assisi, is one of the garden’s many tributes to Fr. Francis Browne, C.Ss.R., who served as the pastor of Sacred Heart from 2003 until his death in 2009. A marble statue of St. Francis will rest to the right of the cross; in the center of the cross, a fountain depicting two children will serve as a permanent reminder of Fr. Browne’s love for the young people of the parish. Eventually a marble statue of the parish’s patron, St. Alphonsus de Liguori, will stand to the left of the cross. Although there is still more work to be done, the garden is already open to anyone who needs a moment to reflect and pray.